The author has had the pleasure of attending two USPS First-Day stamp issuing ceremonies in the New York area during the past month. Held at the Smithsonian Cooper-Hewitt, National Design Museum, near the Guggenheim in Manhattan, this elegant set of 12 stamps commemorates 12 giants of industrial design. The ceremony was attended by many relatives and descendants of the designers featured. Afterward I finished up my visits to all the post offices of Manhattan south of 110th Street. My friend, a Linn's Stamp News editor, got his First-Day program covers cross-canceled at Macy's to validate that these were obtained in New York, and not in Kansas City. This set of four Forever stamps was issued at the U.S. Merchant Marine Academy in Kings Point, New York. The Kings Point post office was discontinued in May 2009, but continues as a private mailroom. The Academy's mail is handled by the Great Neck post office. Still listed on USPS's Post Office Locator tool, the 'post office' for Kings Point is listed as being at Great Neck's Old Village Station. There is no Kings Point postmark available. The ceremony's First-Day cancel stated Great Neck, and the ceremony was run by New York's Triboro District -- even though it is, indeed, slightly beyond the geographic confines of New York City. David Cochrane detailed a history of USMMA ships and their contributions to wartime supply and peacetime transportation efforts. A USMMA pin was presented to stamp artist Dennis Lyall by the Honorable David T. Matsuda. 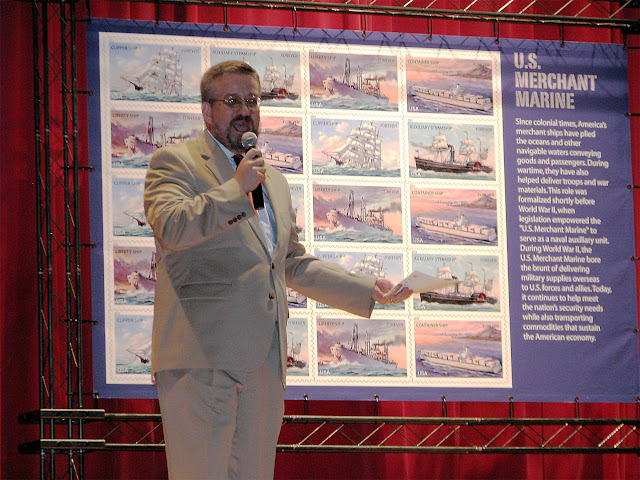 Below: The unveiling of the stamps. 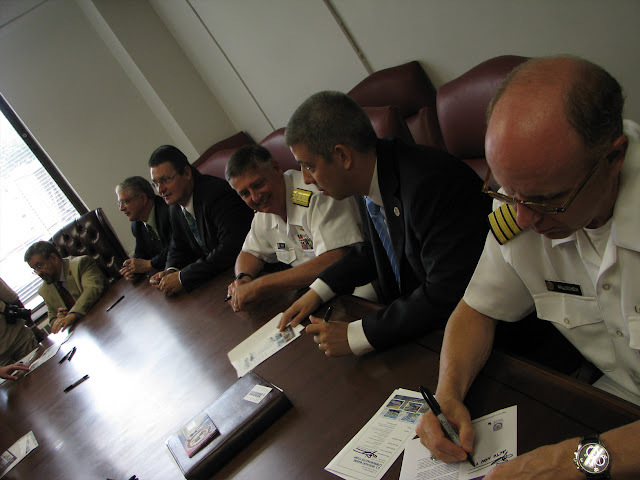 Left to right, visible: James Cochrane, VP: Product Information, USPS; USMMA Midshipman, Captain Laurellee Kopras; the Honorable David T. Matsuda, U.S. Maritime Administration. Below: Prof. Joshua M. Smith, Interim Director of the American Merchant Marine Museum [which I visited afterward; it is pretty interesting, and on the Kings Point grounds!] noted some of the connections between the U.S. Merchant Marines and American postal development. For example, merchant mariners informed Ben Franklin of the Gulf Stream; by charting it, Franklin was able to expedite mail service across the Atlantic. He looks like a comedian in this photo. His speech was quite engaging. A Great Neck Plaza Village Trustee announced that its Mayor had declared July 28, 2011 to be U.S. Maritime Heritage Day. Afterward was a program-signing ceremony by the speakers. The guys were all really friendly and fun to chat with! Philatelic services and stamp sales were provided by a table outside the auditorium. The Flushing Mobile Unit, a "Post Office on Wheels" that is often found on Flushing's Main Street and Queens Boulevard, provided additional sales support. It even had its own postmark, and I got my programs cross-canceled there.